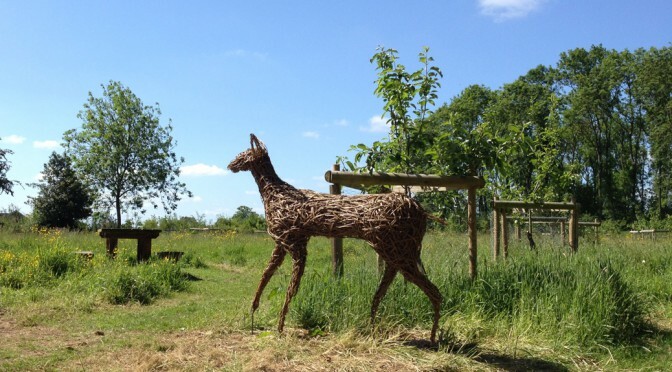 Weaving willow sculptures in Bourne Community Orchard over the past ten days has proved to be the perfect ‘office’, (as described by my visitors) the perfect setting for this kind of creativity. Many people have asked me how I began weaving; It all started back in 2008, having graduated with a 2:1 Fine Art Degree from Anglia Ruskin University in 2006. I was awarded a commission, after putting in a proposal to Lincoln County Council, to create a twelve foot standing willow figure. Prior to this, I had just completed a two week solo exhibition at the Sam Scorer Gallery, by the castle in Drury Lane, Lincoln. I felt tremendously proud that my large canvasses adorned every wall and my sculptures were displayed in the spacious room. The show was the result of a two year body of work which explored a theme which inspires me greatly. Entitled ‘Between Worlds’ I had produced visual thoughts and ideas, feelings, atmospheres, both representational and abstract about aspects of spiritual ancestral beliefs and our beautiful natural world. Carvings of oak and stone, displayed on the floor, and a suspended installation, called ‘Ancient forest’ of restored and beautified bog oaks hung from the beams. Few people realise that such bog oak findings may predate Stonehenge! I was in my absolute element and imagine my delight when I saw my name and show title advertised in the Guardian listings, with an eloquent description kindly written by a Sam Scorer Treasurer Peter Moss. www.samscorer. Haconby. (Open every Friday to purchase many sumptuous items of furniture, accessories for home and garden, including smaller willow creations) Whilst working on a stag in Somerset, in a field with a beautiful view of Glastonbury Tor, the organiser of the Healing Field at Glastonbury Festival visited and asked if I would produce a willow sculpture garden in the ‘air space’. I was elated, needless to say I have been walking on air ever since, strange too as several years before I had formed a list of things I wished ‘to do’ before I turned fifty, one of the things on there was to do an Art Installation at Glastonbury Festival. This brings me to a few weeks ago, when I was stuck for space to work on this willow body of work. I chatted to our Bourne’s lovely Willie McLaughlin’s wife and she had spoken to Willie who said to approach Sarah Roberts. I did rather nervously enter the orchard and approached the lovely Jayne who was so friendly and helpful. She then forwarded my request to Sarah Roberts. Thanks to my lovely visitors, Angela Adams and her gift of honey, Bob who enlightened me of a interesting geography website, he took a photo of me making the boxing hare for his grid reference. the lovely Goff leggitts, Sally Pepper and loads of other lovely folk. Surprisingly, I did discover many towns folk are still unaware of the Orchards existence, what a pity for them. Our Community is very privileged to have this place of beauty to visit, enjoy, relax and contemplate in. I am sure you will see me lending a hand or sculpting again here in the future, what an achievement Friends of Bourne Wood, what a joyful legacy you have made and tend still. To view Tupholme Abbey willow man, Sam Scorer Exhibition as mentioned visit www.nickimclean.co.uk or e-mail nicola.mclean@live.co.uk for commission queries. Part tree, part artwork, our living willow sculpture received a welcome maintenance session this week. Originally called ‘Shelter Skelter’, the sculpture was created by landscape artist Clare Wilks and has provided interest to visitors for more than twenty years. 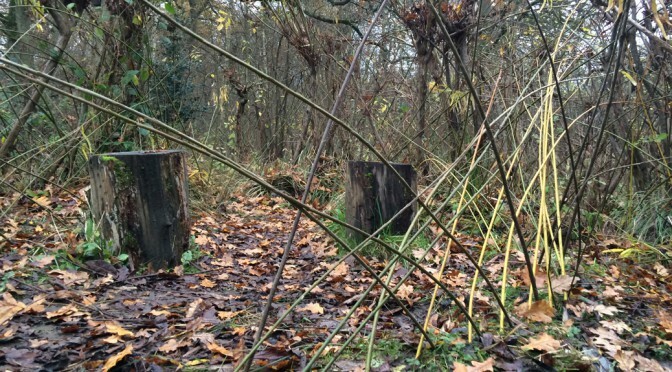 Most of the long rods formed over the last 12 months were removed and replanted to create new sculptural borders or ‘fedging’ – the term used to describe living willow borders (literally a cross between ‘hedge’ and ‘fencing’). The once-lost central section was replanted too with the aim of recreating the original inner circle. Flexible willow rods easily take root and can produce fresh leaf growth as early as late spring. Take a look yourself; aim east and north from the car park and you’ll find the sculpture situated on the side of the main path just past Diana’s Glade.